In the brewery business returned bottles need to be separated according to colour before being washed and ready for production. When moving their sorting station for returned 33 cl glass bottles to a new building, Spendrups had the opportunity of designing their own tailor made solution. Spendrups wanted to achieve a sorting station that was taking up less floor space than the one they were replacing, as glass bottles are in less demand. 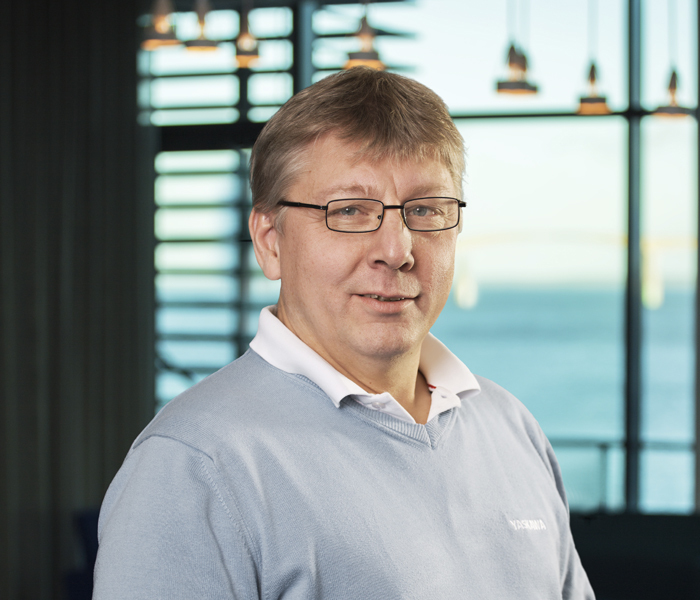 For working out the specific robotic solution in detail, Spendrups enlisted Kopparbergs Robotteknik who has successfully designed other robot cells for Spendrups. From incoming pallets filled with returned glass bottles, still in their red plastic crates, the large MPL500 robot picks up one layer at a time. The robot deposits these crates on a conveyor and makes use of the ingenious dual function of the Air Grip gripper to immediately pick up the bottles from the crates and place them on another conveyor. Thus separating bottles from crates. A sorting machine then separates the browns and greens from the translucent bottles. 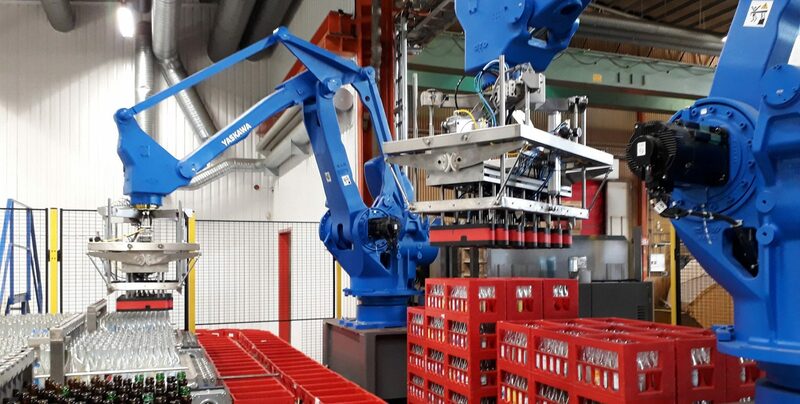 These bottles will at the twin robot station, on different conveyors, where the two MPL300 robots also use the Air Grip tool to place bottles into crates, and filled crates on pallets to be transported for washing. The robotic de-palletising and colour separating cell is able to handle 30.000 bottles per hour. It generally operates on a day shift, but is capable of running on a two shift when the demand is high. Equally important is the fact that the working environment has been improved with a reduced noise level, more user friendly equipment and an increased safety. The facility in Stenhamra had a production line with an existing machine for bottles in multipack supplemented with manual handling of free bottles and bottle holding trays. It had become unsatisfactory both in terms of the working environment and capacity, and the machinery was overdue for replacement. Kiviks Musteri wanted to have a better and more efficient production line on the existing floor space while keeping the functional equipment, like safety fence, pallet magazines, conveyors etc. It should handle both multipack and free bottles. It was also important that the new production line should be able to operate with the same capacity regardless of the skill of the individual operator. Yaskawa Nordic and ABTrygg worked out a solution with two palletizing robots that could replace the human operators on the existing floor space. These two palletizing robots, MPL500 and MPL80, are able to work separately with different tasks, as well as cooperating in order to speed up the cycle times. The touch panel enables operators to easily choose preprogrammed robot jobs that runs the production work flow through the robot line. The robotic cell is working well in its current two shift operation. A potential future improvement is for the small MPL80 to take over the task of supplying new trays, which will save one operator of doing so manually. MPL500 robot, MPL80 robot, Air Grip tool, Roller top gripper, Sorting table, Existing conveyors etc. Roma Mineralvannfabrikk AS is an award winning family owned company with an almost hundred year long history of making soft drinks from their own recipes. In addition to this the factory also has license production of other brands, as well as special production of beverages with their own labels for companies, teams and associations. Good design, good quality and good traditions is producing world class soft drinks at “Den Lille Brusfabrikk” in Lillestrøm today. In 2014 Roma was faced with an increased number of orders that also required more flexibility than the traditional production methods of a small brewery. It was more or less a question of continuing with all these types of soft drinks and various PET bottle sizes, or not. Roma took the plunge and settled for a flexible, and yet financially obtainable, robotic solution with two MOTOMAN robots and gripper tools from ABTrygg. Equally important was the clever design of a sorting table able to handle both single bottles and bottles in multi packs. This would ensure Roma the necessary flexibility in production in the years to come. With a new and modern packaging system, Roma have been able to offer new customers attractive solutions that have made results for the factory. Due to the new flexibility the company has been able to increase its sales by about 30 per cent. – It’s important to have production equipment that can keep up with changes. That is what the patented Air Grip bottle gripping tool and MOTOMAN robots are all about! Want to know what Air Grip and MOTOMAN robots can do for you? Fill in the form and we will get in touch!